There are some insane open jaw flight prices out there, where you fly from Vancouver to Vietnam and then fly home from Manila, Philippines to Vancouver - all for just $460 CAD including taxes. Tip: For flights from Vietnam to the Philippines, have a look at Cebu Pacific Air. They don't show up on many travel search engines, but have non-stop flights for around $96 to $123 USD. If you change it to 'United States of America English' in the top right corner before you search, the prices will be in $USD, instead of the Philippine peso. If you're really ambitious, you can find some amazing deals where you fly from Vancouver to Tokyo, Japan (spend time there) and then fly to Vietnam (spend time there), and then fly back home from the Philippines, all for the incredible price of just $506 CAD including taxes. Play around with the dates, focusing on the same months as listed above. Focus on Mon/Tue/Wed/Thu dates to see what comes up. You can try selecting the flights in Google Flights to see if it's bookable through one of Google Flights booking partners. Sometimes it is, and sometimes it isn't. vancouver, yvr, flight deals, asia, southeast asia, ana, all nippon airways, manila, philippines, mnl, ho chi minh city, sgn, vietnam and saigon. 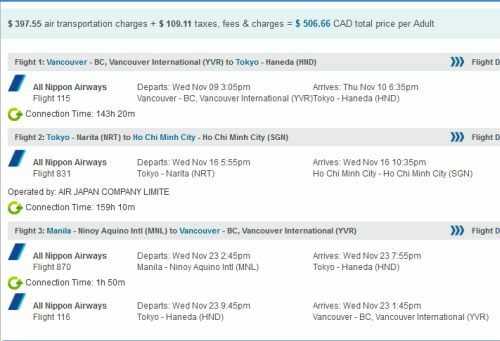 10 Responses to "Vancouver to Vietnam, and then the Philippines to Vancouver - $460 CAD including taxes | add Japan for $46"
Awesome! I noticed it goes from SEA - NRT (Tokyo). You think that means you can have a stopover in Tokyo without paying more? Dan: I added a paragraph to the bottom that shows how to add Tokyo, Japan. It seems to add around $46 to the price. $506 with Tokyo, Japan included is the cheapest I've seen. Thanks for finding this amazing deal. Question: When I click the "book with ANA" link at the bottom of the Google flights quote page, it takes directly to the ANA home page. Not to a link where I can actually book. Then when I enter the flight info in the ANA reservation page, the flight is almost twice as expensive. Just a data point: Booked from YYJ with Jan departure and February return through Flighthub at 419. It was cancelled about an hour later. Just rebooked through Cheapoair with slightly different itinerary - hopefully it sticks! Thanks Chris! Thanks for this! Will be booking very soon. For the flight details, does this include from Vietnam to Manila? I somehow don't see a connecting flight from Vietnam to Manila. No problem Megan! Have a great trip! Lovely: I added a note to the top of the blog post, you may want to check out Cebu Pacific Air for non-stop flights between Vietnam and Manila at a reasonable price. Machela: Thanks for letting me know. Please keep us updated on what happens with the CheapoAir booking. 1/8 YVR-HND, 1/10 NRT-SGN, 1/29 MNL-HND-YVR on flightnetwork.com for C$387 after $10 coupon code 3P10OFF321. Booking code with ANA was sent right away, and eticket was sent in 20 minutes, so hopefully this isn't a mistake fare. For similar dates, backward (PH first, then VN) is available for slightly more, but I didn't like having overnight AND NRT/HND land transfer, while my itinerary has only 4 hours layover at HND on 1/29. I also tried to make a stay in Japan for about a week, but it costs at least $150 more, which is still a bargain considering how much it normally costs YVR-TYO round trips, but at least I have a 'free one night stop over' this time (albeit it involves HND-NRT transfer), so I'll travel Japan some other time. Does anybody know anything about free transit hotel offers by ANA? Does the flights include any free checked in baggage allowance?